This project was molded off of the famous cooking show; Chopped. I was put in a group of five and we were given five key ingredients that we had to creatively use in a dish. So, the key ingredients where zucchini, sesame seeds, ground beef, cucumbers and cream cheese. My group and I decided to make zucchini boats layered with cream cheese and brown rice stuffed with sauteed ground beef with bell pepper, onions and garlic. We were required to make this dish without any additional knowledge other than what we learned in class, which consisted of; Vons cooking challenges, food around the world potluck, laws of cooking, physical v. chemical change, origins of cooking, science behind cooking meat and fermentation. Using this class experience my group and I were able to create a whole dish that we presented to five judges who scored us on taste, presentation and creativity. 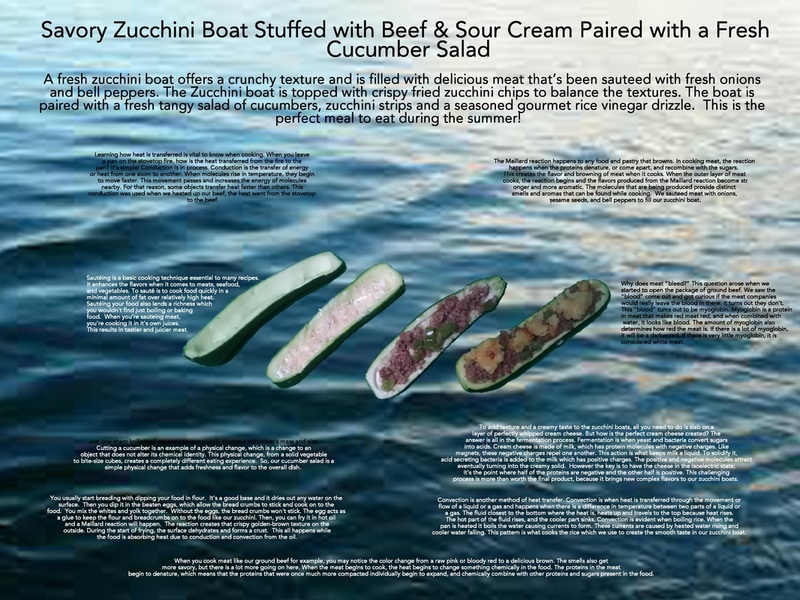 For this competition I had to create a Modernist Cuisine poster explaining ten science concepts that my zucchini boat underwent through the cooking process. To add some humor my group and I decided to place the zucchini boats floating on a lake, because after all they are boats. The link above shows the magical process of cooking zucchini boats. My whole group was involved in making or editing this video. Before this project I was hopeless in the kitchen; my cooking skills extended to Kraft Mac N Cheese. Through this project I learned the difference with pairing flavors, the science behind tender meat, and how you can create something delicious from nothing. Even though my groups dish came in dead last I am very proud of what I created. My zucchini boat had crunch, had flavor and different combinations that taste well together. Something that I would do different is figure out a way to keep the dish fresh and crisp, because it was a little soft when I presented it.